Just in time for Valentine's Day, experience the oohs and ahhs of a spa day for free at Exhale's grand opening event. 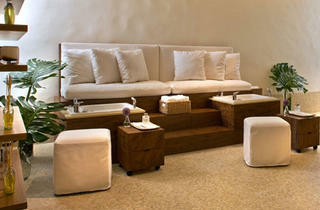 The new spa within the Loews Hollywood Hotel is a sister location to Exhale's Santa Monica digs. Guests at the grand opening will be pampered with complimentary mini massages, manicures and brow waxing. Enjoy light bites and drinks as well as beats by DJ Gingee—plus, the first 100 guests will receive swag bags. This is one spa party that's not to miss. If you plan on attending, e-mail rsvp@exhalespa.com.